With multiple uses in photo and video production, this Double Flat-Edge Spigot Adapter from Impact features a 5/8" diameter steel pin for a variety of grip gear with 5/8" receivers, and both 1/4"-20 and 3/8"-16 male threads for additional mounting options. The flat edge or lip on both sides provide secure non-slip mounting in the receiver, while the knurled center ring provides a firm, grippy surface to facilitate screwing into a receptacle by hand or with a wrench or pliers. 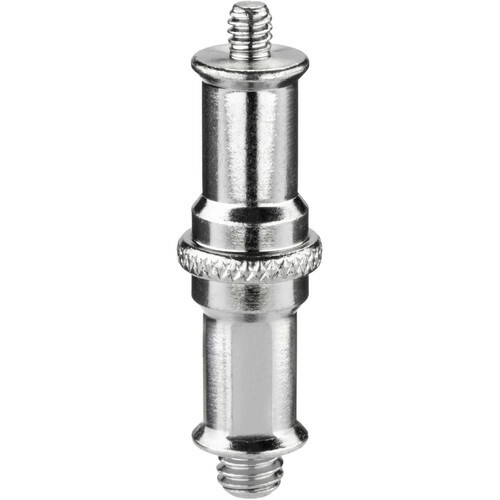 Box Dimensions (LxWxH) 3.6 x 2.8 x 0.7"
Double Flat-Edge Spigot Adapter is rated 5.0 out of 5 by 1. Rated 5 out of 5 by Ricky from Solid! I’m using this with an all-metal multi-flash bracket to hold four flashes. I wanted something solid and this fits the bill nicely. Feel very confident that it won’t fail holding up all that equipment.